Chief Executive Officer and Co-Founder of ESD America Inc.
Les is an intelligence professional with more than 20 years experience spread across both government and private sectors. In the last decade he has been instrumental in bringing awareness of electronic surveillance techniques to more than 38 countries. Team leader and senior trainer for Technical Surveillance Counter-Measures (TSCM) Operations in the Asia-Pacific and the Americas for government clients in more than 25 countries. Les currently advises military, police and media on policies and procedures to identify and locate IMSI catchers. Along with the research conducted in conjunction with ESD America’s German partners, ESD America currently offers the most formidable defense against IMSI Catcher attacks. In 2015 Les commenced seminars for government and telecommunications industry stakeholders on current attack vectors for espionage and billing fraud through the SS7 protocol. A distinct advantage being the ability to actually demonstrate the attacks and counter-measures. Coordinating global cellular network penetration testing to enhance national security and maximize profits. To this date more than 20 cellular communications providers have gained insight and increased security through this testing with a further 30 tests expected in 2016. Mr. Goldsmith advises CSFI staff members on Technical Surveillance Counter-Measures. 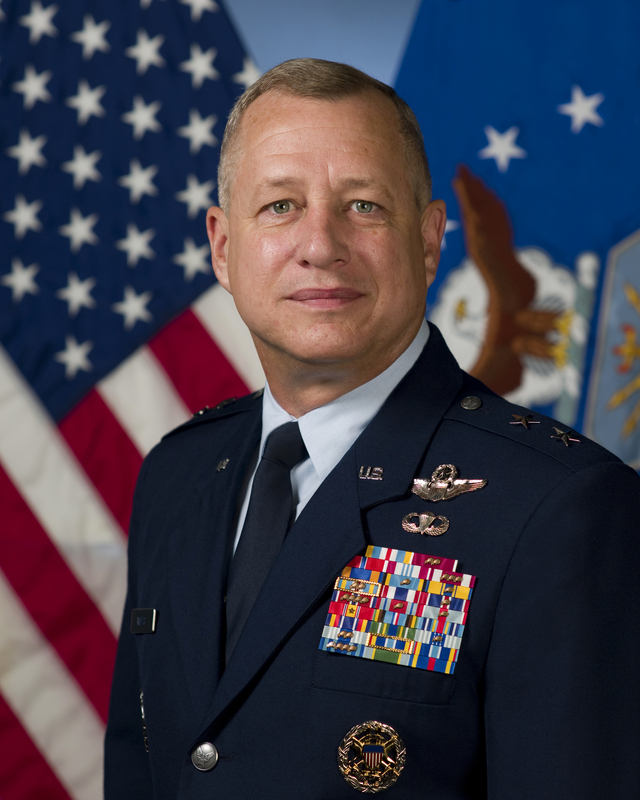 Maj. Gen. Lawrence L. Wells is the former Commander, 9th Air Force, Air Combat Command, Shaw Air Force Base, S.C. The 9th Air Force comprises eight active-duty wings and three direct reporting units in the Southeastern United States with more than 400 aircraft and 29,000 active-duty and civilian personnel. The 9th Air Force is also responsible for the operational readiness of 16 Air Reserve Component wings. General Wells graduated from the U.S. Air Force Academy in 1978 and completed undergraduate pilot training the following year. He served as an F-16 pilot, instructor pilot, weapons chief and operations officer. The general held staff positions at the major command, numbered Air Force, Air Staff and Joint Staff levels. His commands include a fighter squadron, operations group, reconnaissance wing, and an air expeditionary wing in Southwest Asia. Prior to his current position, General Wells was the Deputy Chief of Staff for United Nations Command and U.S. Forces Korea, Yongsan Army Garrison, South Korea. He also served as the U.S. member of the UNC Military Armistice Commission, which leads general officer talks between the UNC and North Korean Army and interacts with UNC liaison groups from 19 nations. The general is a command pilot with more than 2,800 flying hours. 1978 Bachelor of Science degree in computer science, U.S. Air Force Academy, Colorado Springs, Colo.
1985 USAF Fighter Weapons School, Nellis AFB, Nev.
1992 Master of Science degree in political science, Auburn University at Montgomery, Ala.
1995 Armed Forces Staff College, Norfolk, Va.
2005 National Security Management Course, Syracuse University, N.Y.
2011 Joint Force Air Component Commander, Maxwell AFB, Ala.
2. January 1980 – March 1980, Student, fighter lead-in training, Holloman AFB, N.M.
5. October 1982 – January 1984, F-16 A/B Instructor Pilot and Wing Standardization and Evaluation Flight Examiner, 19th Tactical Fighter Squadron, Shaw AFB, S.C.
6. January 1984 – May 1984, Student, U.S. Air Force Fighter Weapons School, Nellis AFB, Nev.
7. May 1984 – January 1985, Chief of Weapons, 19th Fighter Squadron, Shaw AFB, S.C.
12. August 1991 – July 1992, Student, Air Command and Staff College, Maxwell AFB, Ala.
13. August 1992 – October 1993, Power Projection Team Programmer, Headquarters U.S. Air Force, Washington, D.C.
14. October 1993 – August 1994, Defense Resource Manager, Program and Budget Analysis Division (J8), Joint Staff, the Pentagon, Washington, D.C.
15. August 1994 – August 1995, Executive Officer to the Director for Force Structure, Resources and Assessment (J8), Joint Staff, the Pentagon, Washington, D.C.
16. August 1995 – July 1996, Chief of Safety, 20th Fighter Wing, later, Operations Officer, 77th Fighter Squadron, Shaw AFB, S.C.
17. July 1996 – July 1997, Commander, 308th Fighter Squadron, Luke AFB, Ariz.
18. August 1997 – June 1998, Student, Air War College, Maxwell AFB, Ala.
19. June 1998 – June 1999, Director, Air Force Executive Review Secretariat, Headquarters U.S. Air Force, Washington, D.C.
21. July 2001 – April 2004, Chief, F/A-22 System Management Organization, Headquarters Air Combat Command, Langley AFB, Va.
22. April 2004 – August 2004, Deputy Director for Requirements, Headquarters ACC, Langley AFB, Va.
23. August 2004 – May 2006, Commander, 9th Reconnaissance Wing, Beale AFB, Calif.
24. May 2006 – June 2007, Deputy Director of Air and Space Operations, Headquarters ACC, Langley AFB, Va.
26. June 2008 – July 2009, Director, Warfighter Systems Integration and Deployment, Office of Warfighting Integration and Chief Information Officer, Office of the Secretary of the Air Force, the Pentagon, Washington, D.C.
28. October 2011 – present, Commander, 9th Air Force, Air Combat Command, Shaw AFB, S.C.